On Super Bowl Sunday 2017, the Patriots made history yet again, becoming the champions of Super Bowl LI in the first ever overtime win. 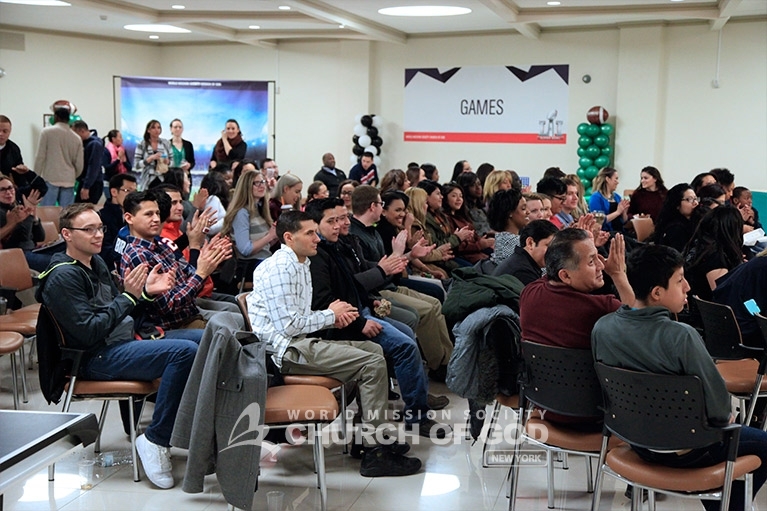 The Church of God hosted a Super Bowl extravaganza, displaying the big game through a 16-foot HD cinematic projector. 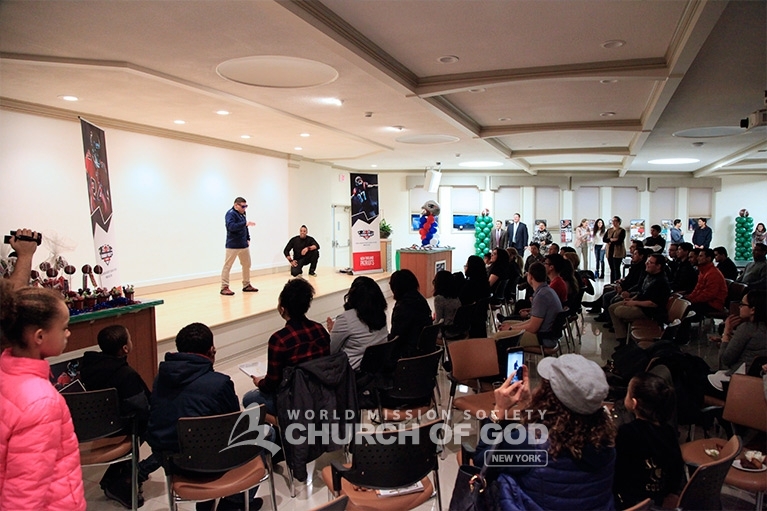 The World Mission Society Church of God transformed its fellowship room into a sports fanatic’s dreamland. The venue was fully equipped with sports entertainment necessities. To no one’s surprise, the nacho bar and buffalo wings booths were huge hits. Meanwhile, the basketball arcade game and ping pong tables had their own competitions going on in between game breaks. Upon entry, guests were able to submit their own final score predictions. Those who came closest to the final score won prizes at the end of the game. Additionally, a children’s section allowed little ones to play games or get their faces painted. Kids represented their favorite teams by sporting the team colors and logos on their faces. Before kickoff, the Church hosted its own pregame show with a dance performance by Live Energy. Talented Church members performed the songs “I Will Survive” and “Give Me One Reason” before a packed audience at halftime as well. And, to top things off, a whipped cream pie eating competition was held before the start of the second half. Emotions ran high throughout the game as fans rooted for their respective teams. Though the Falcons led for the majority of the game, the Patriots methodically inched their way back little by little. Finally, by the end of the game, the Falcons got their feathers ruffled and lost to the Patriots in a historic overtime battle. No doubt, Super Bowl Sunday 2017 will go down as one to remember. 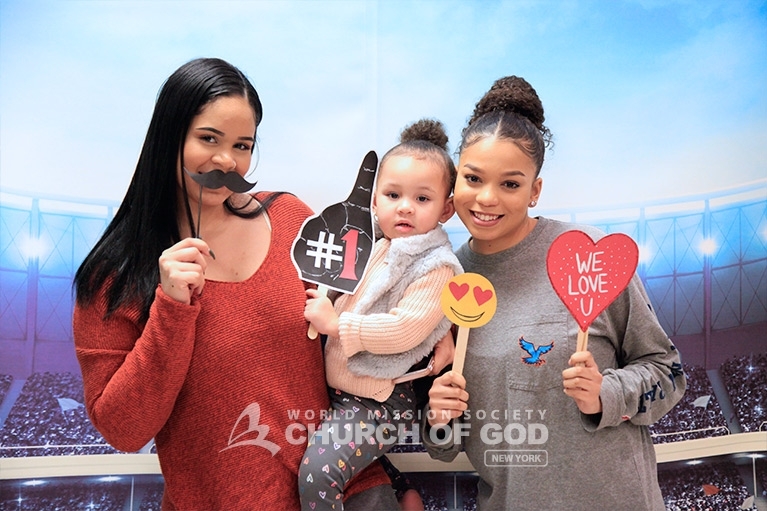 Good company, lip-smacking food and a down-to-the-wire finish made for an electrifying Super Bowl event at the Church of God to say the least. 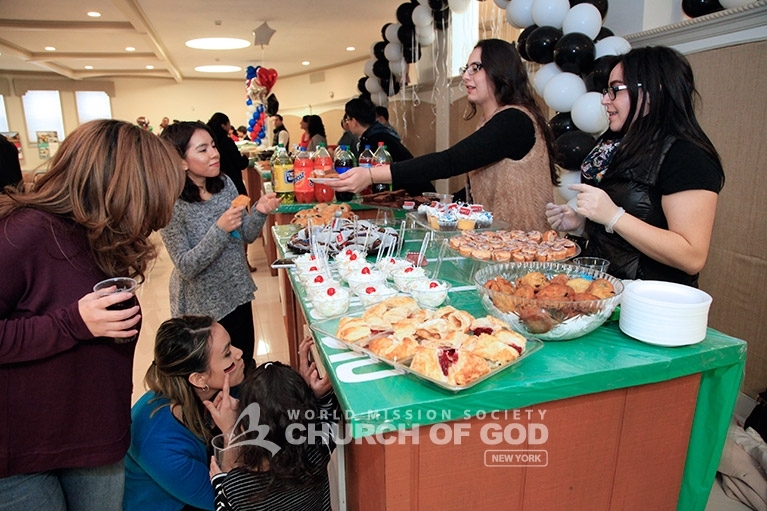 The Church of God served up a variety of game time foods and desserts. A dance crew called Live Energy performed before the big game. Sugar intake skyrocketed at halftime during the whipped cream pie eating contest. Best friends had a great time watching the game together. Even the little one became a fanatic! Look at everyone’s smiling face! This is one thing you will always find at the Church of God. This event was definitely one event to remember for everyone who attended. There was something for everyone! I will absolutely carry the love I feel at the Church of God and share it with our neighbors! Everyone looks like they had a super fun time together. I look forward to seeing even more smiles and new happy faces next time. Truly felt like family that day! Truly at the World Mission Society Churh of God we are a big loving family who knows how to have fun! Epic Super Bowl event! Thanks to Father & Mother for Their sacrifice which brings us happiness and joy. It was a great event !! I had a lot of fun on the day. I think Church of God really makes efforts to bring our family and friends together to share love each other. Great food, games, and fun. Church of God never fails to impress. My wife and I love it! This party was one for the books. It made me think how unbelievable heaven will be. Could you imagine? Thanks to Heavenly Father and Mother we can dream like this. I love the WMSCOG! they look so happy, hanging out with brothers and sisters together! Their happiness came from Heavenly Mother! We are one in Elohim God! Wow. This was a really fun event. I wish I’d been there. It seems like it was a joyful event! I want to be there next time!